VW Passat adds premium features and demonstrate value. 2017 Volkswagen Passat R-Line edition. Family car sales have steadily fallen over the past several years as consumers select crossovers instead. And who can blame them? Crossovers offer superior utility while packing the storage room and towing capability many consumers prize. But crossovers may also cost you handsomely and that is why some new car shoppers are staying with the family sedan, including midsize models that have long ruled the roost. These models typically start in the low $20,000 range, with well-equipped trims costing $30,000 or more. 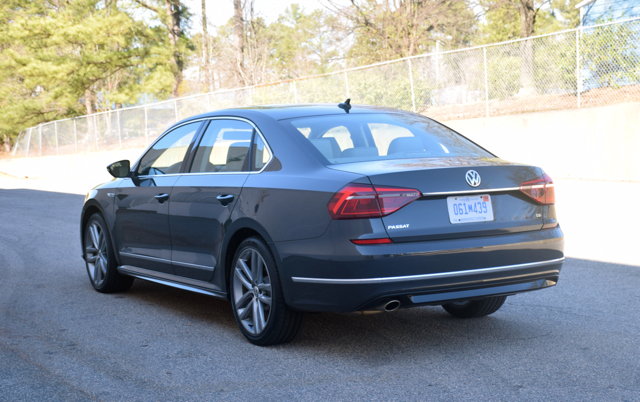 I had the opportunity to drive a 2017 Volkswagen Passat recently, a five-passenger front-wheel-drive model, not unlike the competition. 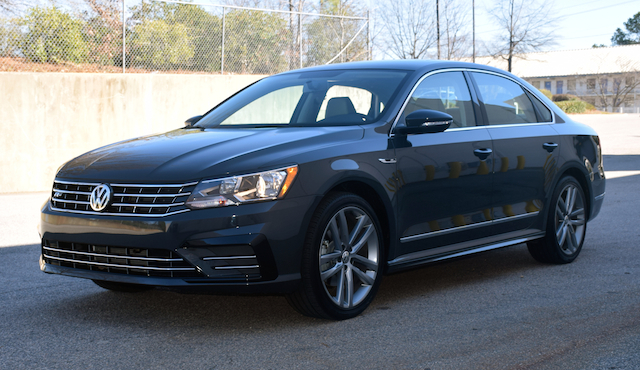 Designed in America and built in Tennessee, the VW Passat isn’t one of this manufacturer’s best sellers nor is it especially a sales force to be reckoned with in a segment dominated by the Toyota Camry, Honda Accord, Nissan Altima, and the Ford Fusion. Indeed, several other models are also found in this segment, including the Chevrolet Malibu, Hyundai Sonata, Mazda 6, and the Kia Optima, giving the Passat a run for the money. Notably, even as several previous competitors have bowed out the market — e.g., Suzuki Kizashi, Dodge Avenger, Mitsubishi Galant, and the Chrysler 200 — Volkswagen is holding firm with the Passat. Plans for the next-generation model are underway; we don’t expect to see one before 2018. Volkswagen offers the 2017 Passat in seven grades: 1.8T S ($22,440), 1.8T R-Line ($23,975), 1.8T SE ($25,495), 1.8T SE with Technology ($27,995), V6 SE with Technology ($29,295), 1.8T SEL Premium ($30,995), and V6 SEL Premium ($33,995). My test model was a 1.8T R-Line with a sticker price of $24,795, including $820 for destination. Changes for 2017 include upgraded standard equipment for the R-Line and SE edition with technology trim. An all-new V6 SE with technology model is introduced. Standard safety equipment now includes forward collision warning and autonomous emergency braking. Additional safety items are available elsewhere. Two very different engine choices are offered. The standard engine is a 1.8-liter turbocharged four-cylinder making 170 horsepower and 184 pound-feet of torque. The other choice is a naturally aspirated 3.6-liter V6 with an output of 280 horsepower and 258 pound-feet of torque. Both engines are paired with a six-speed automatic transmission. If you’re desiring a fuel economy edge, the turbocharged Passat delivers 23 mpg in the city and 34 mpg on the highway. Choose the V6 and you can expect 20 mpg in the city and 28 mpg on the highway. There is much style uniformity across the Volkswagen line with the Jetta and Passat sedans as well as the Tiguan and Touareg SUVs sharing a common theme. That theme is sporty, but sedate, lacking some of the more controversial or cutting-edge styling elements found in certain competing models, including the Hyundai Sonata and Ford Fusion. Yet, the Passat’s sedateness has its own appeal for a model marked by a narrow upper grille flanked by flared headlamp assemblies and a sporty lower grille opening hemmed in by available fog lamps. Distinct creases flow across the hood, from the edge of the grille to the windshield. The sedan’s profile is rather Audi-like with the straight belt and roof lines present. From the rear, you’ll find a trunk lip spoiler, sporty combination lights, reflectors and a single exhaust tip. Most models include chrome-like garnishment across the rear bumper and on the rear fascia. As for wheel choices, you’ll find an assortment of alloy wheels ranging from 16 to 19 inches. Power folding side mirrors, full LED headlights, and a hands-free “easy open” trunk is available. Cabin room in today’s midsize sedans is typically excellent up front, but as for the rear compartment, legroom sometimes is tight. 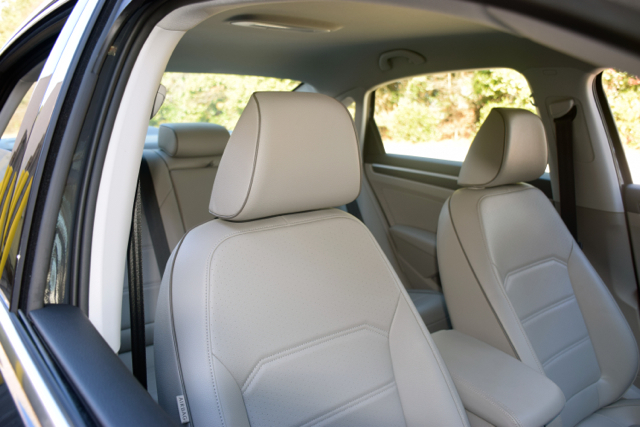 Not so with the Passat as it offers some of the most generous room in the segment — front and back. Cloth upholstery is standard; leather is available. 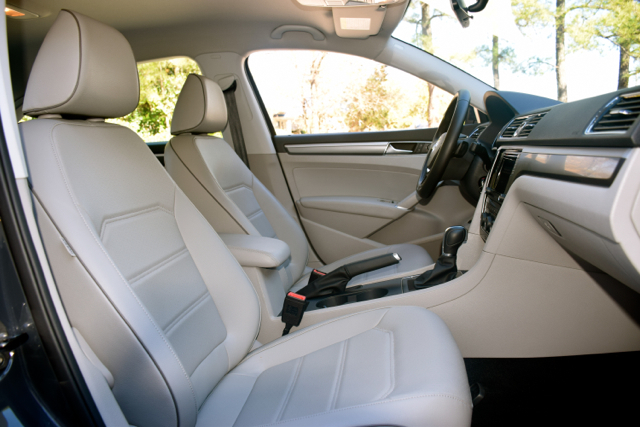 The Passat projects a premium feel with high-quality materials used liberally throughout the cabin. No, it doesn’t rise up to Audi levels in materials used, but fit and finish is equal to what the top European brands provide. Among the standard features, you’ll find power windows and door locks, air conditioning, automatic headlights, a multi-functioning steering wheel, and a touchscreen sound system. Available upgrades are many and include remote start, keyless entry with push-button start, a sunroof, imitation leather seats, heated front and rear seats, and power front seats. As for trunk volume, it measures 15.9 cubic feet. That’s a generous amount of space for this segment. The 2017 Volkswagen Passat is a Top Safety Pick award recipient from the Insurance Institute for Highway Safety and earned a 5-star safety rating from the federal National Highway Traffic Safety Administration. Beyond the expected safety features, the Passat is equipped with a rearview monitor, forward collision warning, and autonomous emergency braking. Also available is a blind spot monitor, adaptive cruise control, lane departure warning, and park distance control. All 2017 Passat models feature the MB II infotainment system, available in standard 5-inch or 6.33-inch color displays. Most versions of this system work with capacitive touch, which means gesture controls are used instead of actual touchscreen contact. Most models also include Volkswagen Car-Net suite of connected services for smartphones, what provides Apple CarPlay, Android Auto, and MirrorLink integration — the three top compatibility systems in the world. All models come with audio system with a CD player, and SD memory card reader, an auxiliary audio port, and a USB port. Three 12-volt outlets are present. Bluetooth technology with audio streaming is also included. A 400-watt Fender premium audio system is also available as is satellite radio. 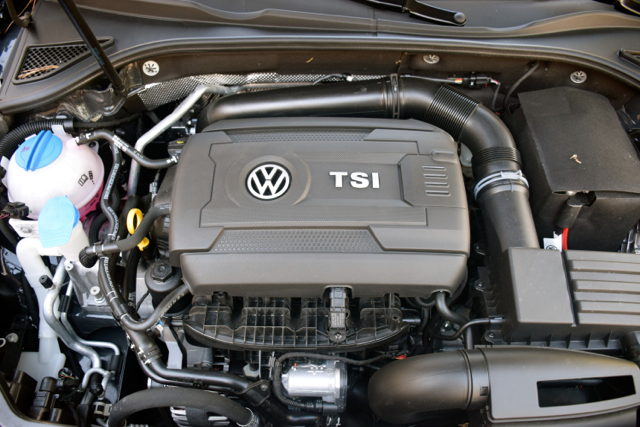 The Volkswagen Passat test model was an R-Line edition equipped with the turbocharged engine. Pull away from a stop and this sedan moves forward steadily, with a measured boost provided as you press the pedal hard. The turbo spools up after a brief pause, delivering copious amounts of power. Unless you absolutely desire top-end performance, you can easily bypass the available V6. The Passat offers a composed ride, matching the top sellers in this segment. Confident steering with nimble handling keeps this sedan evenly aligned between the stripes. Torque vectoring control mitigates understeer — I found myself wondering how the system works when tasked with managing a V6. You won’t find the quietest cabin when driving the Passat. Ample engine noise intrudes, especially when the turbo is pushed hard. Other than that, low levels of wind noise coming in through the front windows was noted. The ride is comfortable, although not cushy, with average lateral bolstering present for the driver and the front passenger. 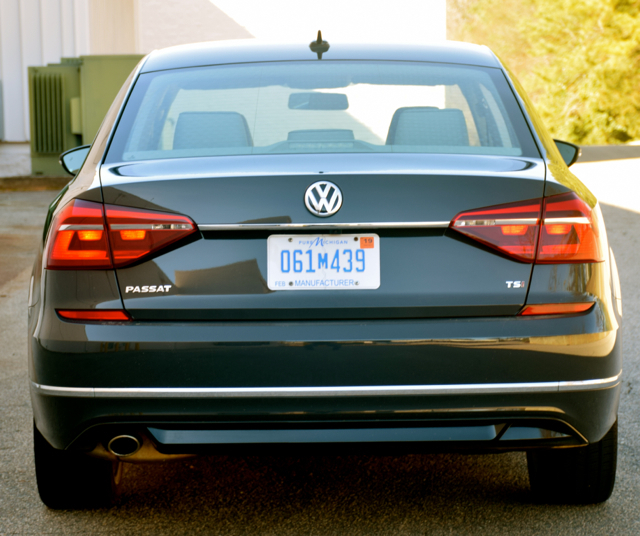 There is much to consider when surveying the Passat product line. It is my opinion that most buyers will start their research looking at the base engine trims. Happily, you’ll find more standard safety equipment this year, even with the entry-level model. My R-Line tester was a handsome sedan and with the price coming in around $25,000, it also provides an enticing price point. 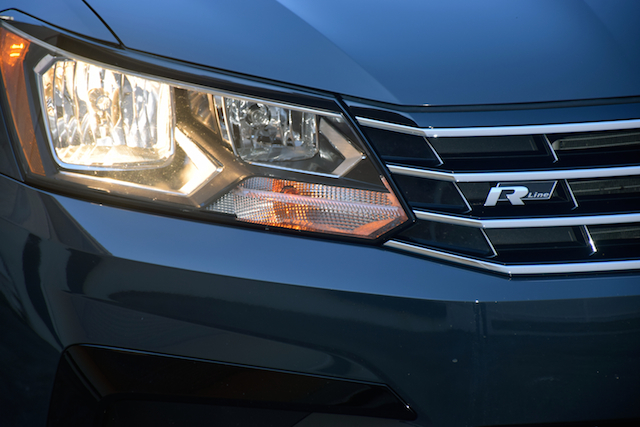 An available lighting package adds LED headlamps with LED daytime running lights and LED tail lights. Thus, your final price for a well-equipped model with cloth seats comes in around $26,000 and that’s actually lower than what some comparably equipped competing models cost. All in all, the 2017 Volkswagen Passat has its place in the midsize segment. Not initially known for value, you’ll now find it here and with updated safety features to show for it.